BlackBerry has purchased a German security firm that counts Angela Merkel as one of its customers in a bid to reinvigorate its enterprise mobility management portfolio. Secusmart was snapped up for an undisclosed sum. The acquisition comes as the Canadian company is aiming to reinvent itself as the most secure handset manufacturer. Both Google and Apple have made it clear that they view the enterprise segment as the next big market to go after following the release of Android L (for Google) and the recent IBM announcement (for Apple). A solution called "Security Card" is at the heart of all Secusmart products. Essentially a computer squeezed into a microSD card format, it integrates an NXP SmartMX P5C T072 crypto-controller with a PKI coprocessor for authentication. 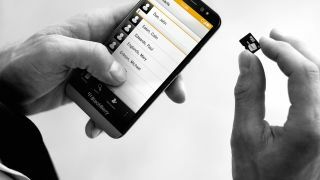 The company's CEO, John Chen, declared that, "the acquisition of Secusmart underscores our focus on addressing growing security costs and threats ranging from individual privacy to national security," adding, "this acquisition bolsters our security solutions with leading voice and data encryption and anti-eavesdropping technologies, and furthers BlackBerry's security leadership in end-to-end mobile solutions."